After more than 30 years in the slammer for trying to kill President Gerald Ford, 60-year-old Manson Family member Lynette “Squeaky” Fromme has been released from Fort Worth’s Federal Medical Center Carswell. And it almost went unnoticed. Being a sly little devil Squeaky Fromme slipped past the media laying low in one of many cars going in and out of the prison’s front gate. The prison officials are not saying where she is planning on living or what she plans to do with the rest of her life. In September 1975 Lynette Fromme made her way through a crowd of people gathered to see and shake hands with President Ford at the California State Capitol in Sacramento, and drew a semiautomatic .45-caliber pistol from a thigh holster hidden under the red robe she was wearing, and aimed it at the President. Secret Service agents surrounding Ford pounced on Fromme and managed to get the gun away from her before it could be shot; President Gerald Ford was not hurt. Only a few years before, Lynette “Squeaky” Fromme was a member of the infamous Manson Family – a murderous cult under the spell of the totally creepy and psycho Charles Manson; she shaved her head and carved an “X” into her forehead after Manson’s conviction. 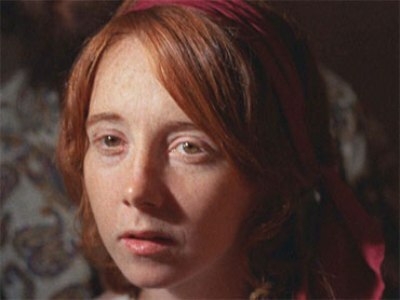 Although she was never implicated in the horrendous 1969 Helter Skelter murders, Squeaky Fromme was certainly an active member of cult, and even took over as leader when Charles Manson was sent up the river to California’s Corcoran State Prison. Side Note: Lynette Fromme was given the nickname “Squeaky” by her fellow Manson Family members because of her voice. During her trial for the assassination attempt against President Gerald Ford, Squeaky Fromme often refused to attend and had outbursts when she did. Virga argued that when Fromme aimed her gun at Ford, she was simply trying to call attention to environmental issues and Manson’s case, and didn’t actually want to kill the President; there were a few bullets in the gun, but the chamber was empty. Lynette “Squeaky” Fromme was convicted to life and became the first person sentenced under a special federal law covering assaults on U.S. Presidents; a statue that had been enacted after the 1963 assassination of President John F. Kennedy. 57 queries in 0.620 seconds.